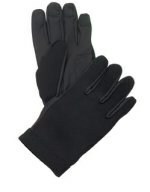 Lightweight all-purpose duty gloves feature a moisture wicking, polyester spandex fabric, synthetic leather palm & fingers for grip and durability, finger and knuckle patches, elastic cuff with hook & loop wrist closure. MultiCam variation has a 4-way stretch softshell fabric: 91% Nylon / 9% Spandex Fabric. Olive Drab, ACU Digital Camo, Black, Coyote Brown, MultiCam, and Woodland Camo.